The Documents storage is one of the most useful tools of Hyper. This tool is used as a Drop Box, for the documents and the files that related to Client / Supplier / Project. Hyper provides its users with an unlimited storage space and a maximal files size of up to 200MB for each file. The documents tab displays all of the files and documents which are related to the current Client / Supplier / Project and allows a customized sorting and filing. 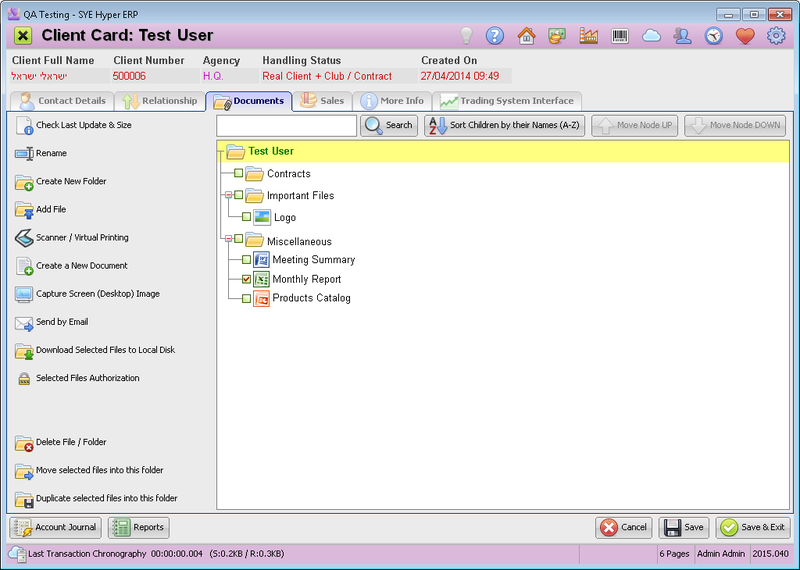 The Documents tab displays the documents tree of the Client / Supplier / Project card which contains all of the folders and files related to the selected Hyper card. After creating a new Hyper card this tab will be empty. The user can create new customized folders or use the default folders (as defined in the Agencies tab of the System Fundamentals), for the related documents and files of this card. The system allows to save the related files and documents into the required folders and for each file displays an icon that presents the type of the file. Each folder and file has a checkbox that makes the action buttons available, as described below. Sort the files and documents of the selected folder by their names. Move the selected file or folder up / down. In order to create a new folder, mark the required node (the main folder or any other customized folder) and press the Create New Folder button and choose the required title for the new folder. This title can be modified be using the Rename button. Add a file from the local computer to the selected folder. Add a file from the scanner or from a virtual printer. In the "Scan into Hyper" window, choose the required action. Fill in the title for this file and press the Scan New Page / Import Virtual Printing button, at the bottom of the window. After scanning / importing the required documents, press the Save & Close button. Scan the pages directly from the scanner to the local computer. 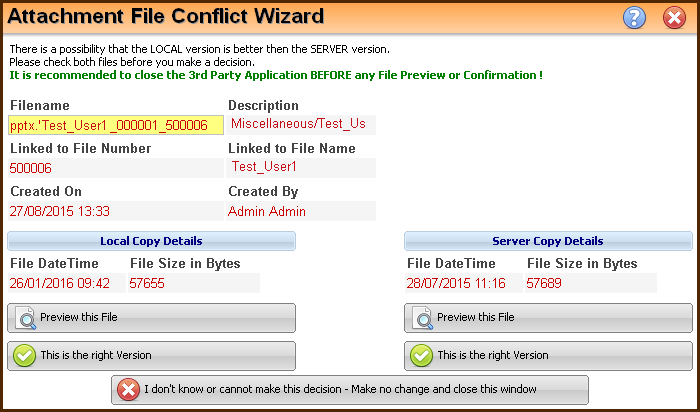 Use the Add File button to add this file to the selected folder. Choose the "Scan Multiple A4 Pages and store it as PDF File" option. Scan each page separately (do not use the scan "feeder") and after each scan choose to scan additional page. After scanning all of the required pages, the system will create a single PDF file of all of the scanned pages. Add a new document from the documents templates. Capture the screen image and set the required borders of the captured image. Press the OK (F6) button and choose a title for the image (The default title will be the time stamp of the screen capture). This image file will be added to the selected folder. change the name of the file / folder. Send the selected files by Email. Save the selected files to the local disk. Define authorizations for the selected file and make it available for these authorized user and groups only. Delete the selected file / folder. In order to move file to other folder, check the checkbox of the file, mark the required folder and Then press this button. In order to copy file to another folder, check the checkbox of the file, mark the required folder and Then press this button. Please Note - the action buttons are available according to authorizations. If there are any unavailable action buttons, contact your system administrator. Click this button on the right version side. I don't know or can not make this decision - Make no change and close this window. When choosing this option, the system will close this window without making any changes. In the Agencies tab of the System Fundamentals, define the required folders in the "Client's Default Doc Folders List" that will be automatically created in every client card. In the Attachments & Templates tab of the System Fundamentals, in the top table, define the allowed files Extensions (in addition to the default file extensions accepted by Hyper). In the Attachments & Templates tab of the System Fundamentals, add the required documents to the second table (New Docs Templates). These documents will be available for the users and can be opened and edited according to the requirements and needs.